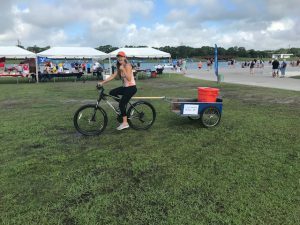 UF/IFAS Extension Sarasota County delivered composting services for the recent NCAA Women’s Rowing Championships held at Nathan Benderson Park, despite waves of rainstorms thrown at the area by an approaching tropical storm. The May 23-27 event drew hundreds of competitors, coaches and supports from teams representing NCAA Divisions I, II and III. A team of Extension volunteers welcomed them to the event with a message to “play greener,” working through the soggy conditions to collect more than 100 pounds of compostable food waste across the three days. One unique aspect of this composting project is that food waste was collected and processed onsite, reducing unnecessary environmental impacts. And, the park ultimately will use composted material resulting from the project. The Sarasota County Extension initiative is thought to be the first closed-loop composting program at an NCAA championship, and is recognized as a model for future sporting events. For more information or to become a composting volunteer, contact UF/IFAS Extension Sarasota County at 941-861-5000 or email rpenn@ufl.edu.